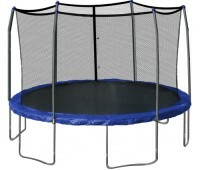 When you picture a trampoline, your first thought is something that sits above the ground on a large frame. While generally pictured as tall and occupying a lot of vertical space, there’s an alternative installation method. This is the in-ground trampoline. In-ground trampolines are excellent for people who don’t want a large, lumbering trampoline occupying so much of their yard space. They’re more aesthetically pleasing, as most of the metal components are hidden. 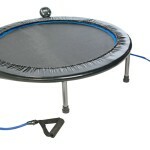 An in-ground trampoline may be exactly what you need, but you’ll want to make some considerations first. 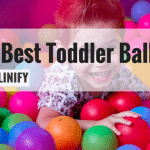 Keep in mind, that almost all trampolines can be used, to create an in-ground trampoline, so you will want to start by finding the best trampoline to use later on. 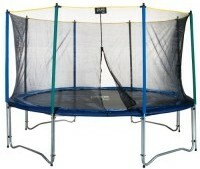 An in-ground trampoline is essentially any trampoline that’s been installed into the ground, rather than on top of it. 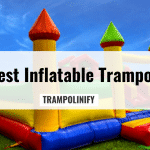 There are some distinct advantages of having an in-ground trampoline, though most of them relate strictly to the appearance of the trampoline. It’s a little more difficult to install an in-ground trampoline, but if you want your yard to look clean and neat, it may be worth the extra work. 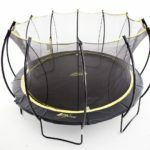 Is an In-Ground Trampoline Safer Than an Above Ground Trampoline? Some people gravitate towards in-ground trampolines because they seem safer than their above ground counterparts, but this is somewhat misleading. 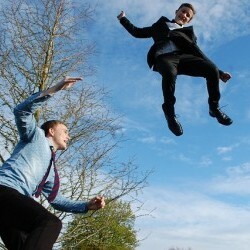 Injuries occur mostly from airborne users falling improperly, and bouncers will still be airborne on either trampoline. Though you may fall from a shorter distance, as the frame will be level with the ground, you can still fall just the same. Installing an in-ground trampoline will still require adequate safety measures – they aren’t inherently safer simply by being installed the way they’re installed. 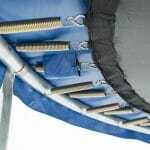 You’ll still need the required safety accessories to make your in-ground trampoline safe. This means you’ll need a working spring pad and an enclosure net to prevent injuries. You’ll need to install the frame exactly to the specifications of the manufacturer, whether or not the frame will be above ground. Just because you won’t be able to see the frame doesn’t mean it’s not there, and it’s proper assembly is still of crucial importance. Where Should I Install My In-Ground Trampoline? Digging an in-ground trampoline involves having properly levelled terrain. It may be difficult to level the area where you intend to put your trampoline, so choosing the right spot can save you tons of work. You’ll want to start with ground that’s as close to level as possible, and you’ll also want to choose a safe area. Never place a trampoline too close to a pool or a building. You’ll want to avoid areas with a lot of trees that can shed and cause damage to your trampoline. The ground beneath the trampoline should be sturdy, so don’t dig too close to a pond, or place your trampoline in an area that’s especially close to an area that’s prone to flooding. A flat, dry spot free from obstacles is your ideal location. How Should I Install my In-Ground Trampoline? 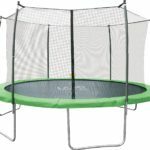 Obviously, you’ll need to measure your digging area to fit the size of the trampoline, with extra space to accommodate a retaining wall and necessary accessories, such as an enclosure net. When in doubt, overdig the area. It’s better to dig a little too much and fill in some more later than it is to try to cram your trampoline and enclosure into a hole that’s too small. You’ll want to dig a little less than the height of the trampoline. If you don’t provide enough of a gap, your trampoline won’t have any room for venting. You’ll need some venting room for your trampoline to work properly. This small gap of space will allow air to travel in and out of the pit. Having your trampoline completely level with the pit will prevent the travel of air. 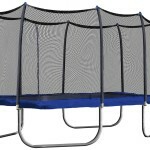 This puts more pressure on the frame of the trampoline, and can actually injure the rider. If the air can’t move freely, the joints of the individual bouncing will ultimately deal with the harsh impact. Once you’ve dug your pit, it’s time to install your retaining wall. This will keep the area around the trampoline from collapsing. Some people use wood to construct these walls, where others prefer metal tubing and plastic sheeting that’s been pulled taught. Whatever material you choose, you want to make sure that it will be durable so it can withstand long term use without needing to be repaired or replaced. You may want to consider placing drainage beneath the trampoline, preventing the area from accumulating water. When it rains, the water will fill the pit beneath the trampoline, and that water will have a difficult time dissipating. Water and metal don’t get along – if you want to prevent rust damage, you’ll need to give the water a way to escape. Some people have found that digging pipes beneath the trampoline gives the water somewhere to go. It’s extra work, but it will help protect your investment. Once the pit is prepared, you’re ready to lower the pre-built frame into the ground. Always follow the manufacturer’s instructions when assembling your trampoline. 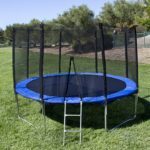 How Should I Use My In-Ground Trampoline? 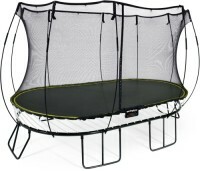 If properly installed, an in-ground trampoline can be used the same way as an above-ground trampoline. 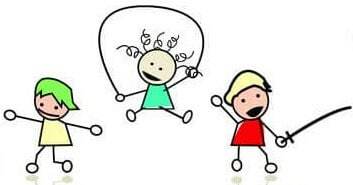 Exercise good judgement, abiding by the manufacturer’s suggested safety guidelines, and supervise children while they jump. 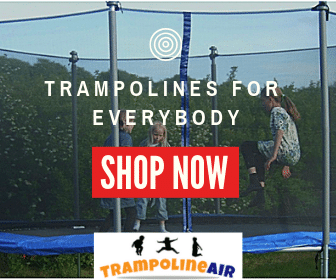 Games designed for trampolines, such as basketball or volleyball accessories, can be used with in-ground trampolines the same as they would with any other trampoline. Don’t forget to routinely inspect your trampoline to make sure it’s in working order. Though it may be more difficult to check key components after they’ve been placed in the ground, it’s a good idea to check the frame every few months and make sure that everything has settled well.